Ancestry.com. New York, Passenger and Crew Lists (including Castle Garden and Ellis Island), 1820-1957 [database on-line]. Provo, UT, USA: Ancestry.com Operations, Inc., 2010. The names found in this collection are linked to images of the passenger lists. Information contained in the index includes given name, surname, age, gender, arrival date, port of arrival, port of departure and ship name. Twentieth century arrivals typically include more details. This collection contains some 2,000 oral histories collected by the Ellis Island Oral History Program through the Ellis Island Immigration Museum. Begun in 1973, the project aims to collect first-hand information about immigrant experiences from everyday life in their country of origin, family history, reasons for coming to America, the journey to the port, experiences on the ship, arrival, processing at Ellis Island, and adjustment to life in the U.S. This database is an index to the passenger lists of ships arriving from foreign ports at the port of Philadelphia, Pennsylvania, from 1800-1962. Check out these New Orleans passenger lists to discover when your ancestor eased into the Big Easy. This database is an index to the passenger lists of ships and airplanes arriving at the port of Baltimore, Maryland, USA, from 1820 to 1964. 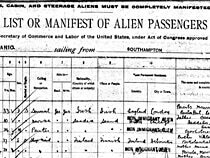 The names found in the index are linked to actual images of the passenger lists and airplane manifests, digitized from National Archives and Records Administration (NARA) microfilm. Information contained in the index includes given name, surname, age, gender, ethnicity, nationality or last country of permanent residence, destination, arrival date, port of arrival, port of departure, ship name, and microfilm roll and page number.